There are multiple types of indoor units available to serve your home's needs. There are the standard wall mount units, there are recessed ceiling cassette units, and there are concealed duct units. The indoor unit(s) you choose should be based on your home's layout as well as your aesthetic preference. The most common of mini-split indoor units, wall-mounted evaporators are the cheapest, easiest to install, and often most efficient option available. Because of their popularity and volume, they are available in the greatest variety of sizes, types, and efficiency. They are also usually the least expensive indoor unit for most applications. Wall mounted units are typically installed near the ceiling on an exterior wall. 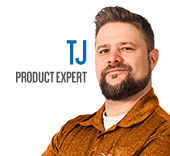 They require approximately a 3" penetration through the wall to connect the refrigerant lines, drain tube, and connecting wire. The wall must be vertical, and the unit must be mounted level. Wall units are typically 30" - 42" wide, 12" tall, and 6"-10" deep. Rooms with narrow walls, high windows, or other obstacles may require a different type of unit. A suitable wall unit can be found for almost any application. They range in size from 6,000 BTU/hr all the way up to 36,000 BTU/hr, and are available for both single-zone and multi-zone systems. They can also be used in both cooling only and heat pump mini splits, and models designed for use in low temperatures are available as well. Some manufacturers, such as LG, even offer wall-mounted units with higher end finishes and discrete designs to better fit with your home's decor. Wall mounted units offer the best combination of value, efficiency, and flexibility for most applications. Ceiling Cassette units mount within the ceiling, leaving only the grille visible when installation is complete. This results in a nearly invisible heating and cooling solution, while still offering the performance of a ductless system. Ceiling cassette units are ideal for installation in T-bar and other drop ceilings, but can also be installed in conventional joist and drywall ceilings provided there is adequate space between joists and vertically above the ceiling. Most ceiling cassettes include lift pumps to simplify the removal of condensate, and many are able to supply fresh outside air to the space being conditioned. There are even some models which will support a branch of duct to condition a small adjacent space such as a bathroom. Ceiling cassette units are available for both single-zone and multi-zone applications, and for both cooling-only and heat pump systems. They generally come in two sizes: 36" wide by 36" deep and 24" wide by 24" deep. The 24" square models are designed to fit between joists spaced 24" on center, while the 36" square models are best suited for drop ceilings. The units typically require 10"-14" of clearance between the ceiling and the surface above. Ceiling cassettes are available in a wide range of outputs from 9,000 BTU/hr up to 48,000 BTU/hr. 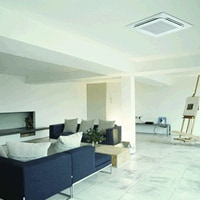 Ceiling cassette units offer all the benefits of a ductless system with a clean and discreet appearance. Concealed duct units sacrifice efficiency to offer flexibility and concealment options not available with other units. These units can be installed completely out of view and condition one or more spaces. 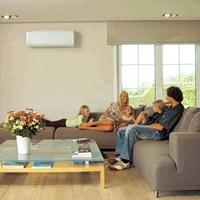 They're a compromise between traditional central forced air systems and ductless mini splits. They are often used in situations where a wall unit is too obtrusive and the construction of the ceiling does not allow for a ceiling cassette unit. A concealed duct unit can be installed in a closet, conditioned attic, or conditioned crawlspace, and use ducts to get the air where the air is needed. A separate connection must be supplied to bring air back to the unit. Because the unit is installed outside of the space being conditioned, only the grilles supplying conditioned air to the space and pulling return air back to the unit are visible. You can choose a grille design in a shape and design to fit your home's decor. Another benefit of using concealed duct units is the ability to supply two small closely situated rooms from a single unit. 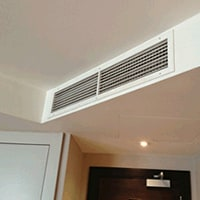 In this type of application, the duct from the unit will branch into two, supplying each of the rooms. The return is often situated in a space common to both rooms such as a closet or hallway. The largest downside to this type of installation is that the thermostat will be in only one of the rooms, so accurate temperature control in the other room is nearly impossible. Concealed duct units are available for both single-zone and multi-zone applications and for both cooling-only and heat pump systems. They come in a variety of shapes and sizes depending on output and manufacturer. Some units offer more powerful blowers that are able to handle longer duct runs or multiple outlets. Nearly all available units include lift pumps to help with condensate removal. If your application can not be served with a wall unit or ceiling cassette, and you are willing to make a small sacrifice in efficiency, a concealed duct unit can provide flexible and discrete cooling and heating for your space. Mini Split Indoor Unit Buying Guide - How to Pick the Perfect Indoor Mini Split Unit. Our heating, ventilation and cooling equipment how-to library can help you pick the perfect comfort solution for your home.